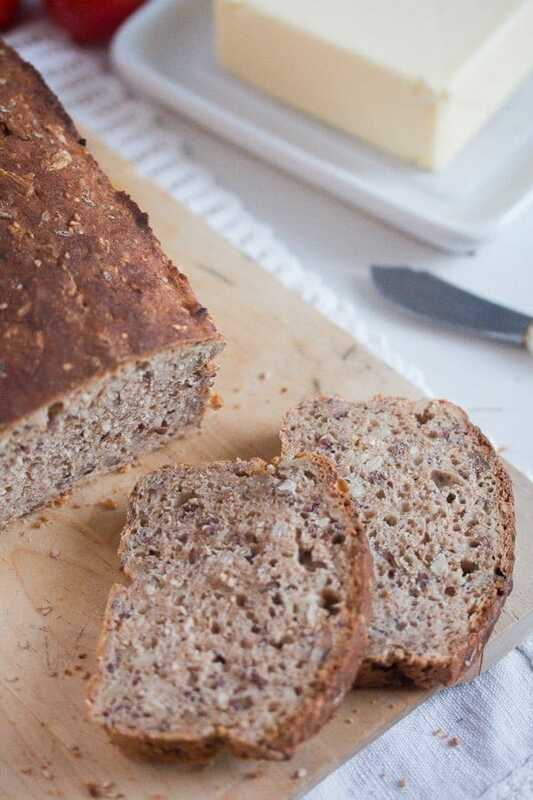 How to make the easiest homemade whole wheat bread (or whole spelt bread). No-rise, no-knead bread ready in one hour. 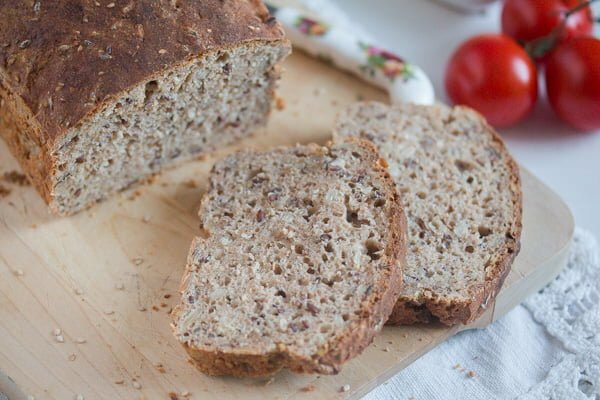 This easy homemade whole wheat bread is absolutely amazing! I discovered this recipe about 10 years ago and I have been making it hundreds of times ever since. It was while living in the UK, more than 10 years ago, that I have started baking this whole wheat bread recipe. The problem was, that although I had only lived for 2 or 3 years in Germany before moving to London, I had already gotten used to the wonderful German bread, which is the best in the world, if you ask me. And then I got to the UK and the bread was terrible. Supermarket bread was mostly white and packed in plastic, soft and disgustingly sweet. There was the tiger bread which, when freshly baked, was a bit better, but you can only eat that much white bread before you get sick of it. Bread baking had never really occurred to me before, as said German bread is so good, the thought of starting baking yourself doesn’t come so fast, but after two months on English bread I had had enough. I was working full time and was spending another 2 hours on the train every day, so I really didn’t have much time for baking. And then I found the recipe for this no-rise, no-knead bread! It was life-changing! A bread that you can mix in less than 5 minutes, place in the cold oven and bake for one hour. And considering there is no-rising and no-kneading involved, this easy homemade whole meal bread is still amazing. 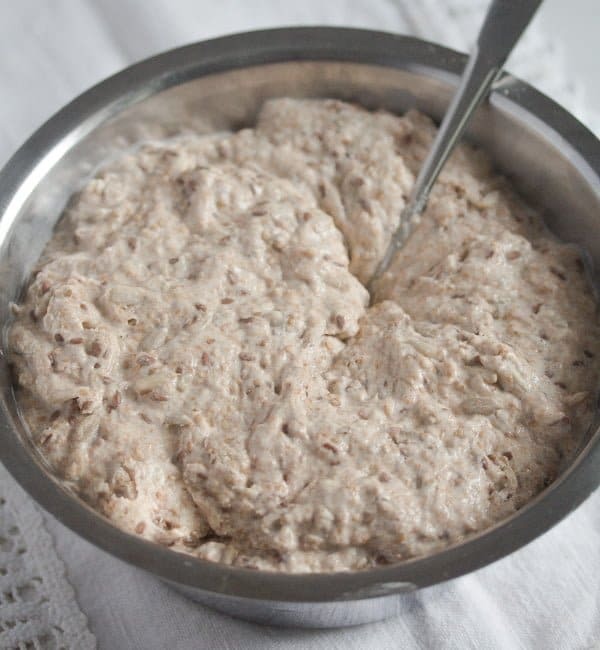 It has a good bite, like any good wholemeal bread, it is crusty, it keeps well for several days and it tastes wonderful. I have moved back to German a long time ago, but I keep baking this easy no-rise bread regularly. 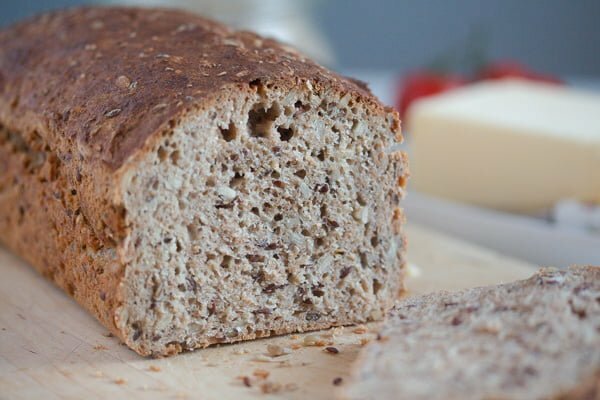 You can make this easy no-rise bread using only wholemeal flour, either store-bought flour or you can grind your own wheat berries. And if you are not keen on wheat, you can make a perfect bread using whole spelt flour, I have done it dozens and dozens of times. You can mix spelt and wheat as well. Sometimes I substitute a small amount of wholemeal flour with some white flour (about 100 g/ 3.5 oz/ ¾ cup + 1 tablespoon) – this makes the no-knead bread a bit fluffier. Sometimes I use a small amount of rye flour, that makes the bread even sturdier. Really, you can be bold and experiment here, find your perfect combination of flours. My favorite would be whole spelt mixed with a small amount white spelt flour. Usually I would use one cube of fresh yeast. Fresh yeast can be bought in any supermarket in Germany, is incredibly cheap (9 cents) and yields perfect results. One cube of German fresh yeast weighs 42 g/ 1.5 oz. Fresh yeast needs to be dissolved in lukewarm water before mixing it with the rest of the ingredients. The bread pictured here is made with instant dry yeast. If fresh yeast is not available (I remember that it never was in the UK) or it is too expensive (I have heard that the half amount of fresh yeast costs about 2 dollars in the US, which is crazy), you can always switch to active dry yeast or instant yeast, whichever you prefer. If I use German dried yeast (which is instant), I use two small packs, each containing 7 g/ 0.24 oz. They don’t have to be dissolved in water, you can mix the yeast with the flour directly. If using active dry yeast, you will have to dissolve it into the water as well. 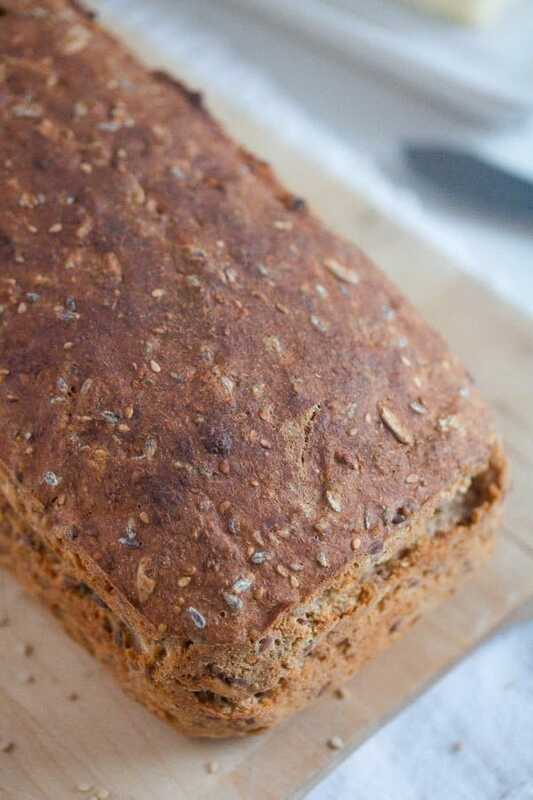 This easy homemade whole wheat bread contains seeds as well. I use equal amounts of sunflower seeds, flaxseeds and sesame seeds. 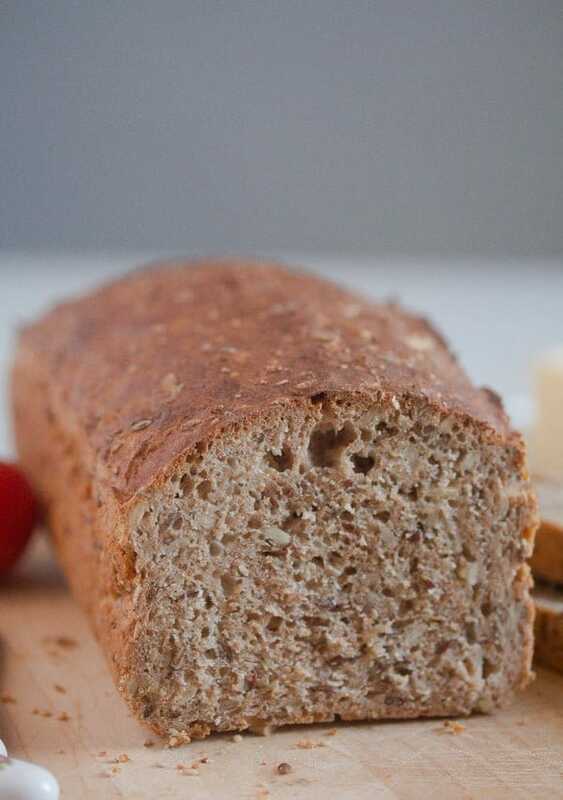 You can mix the ingredients for the whole wheat or whole spelt bread in a matter of minutes, than bake it without letting it rise, you don’t even have to preheat the oven. There is also no kneading involved either. Step 1: Take one bowl and place it on the scale (if using a scale, cup measuring works as well). 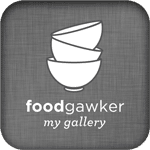 Give the lukewarm water to the bowl and crumble the fresh yeast into the water. Stir until dissolved. Step 2: Reset the scale. Add the flour, seeds, salt and vinegar. Step 3: Mix everything together with a tablespoon. The dough will be pretty wet and pourable, no way you could ever knead that mixture. Step 4: Butter a loaf tin and pour the dough inside. Level it with the spoon. Step 4: Place the tin in the cold oven. Set the oven to 200 degrees Celsius/ 400 degrees Fahrenheit. Set the time to 1 hour. Done! 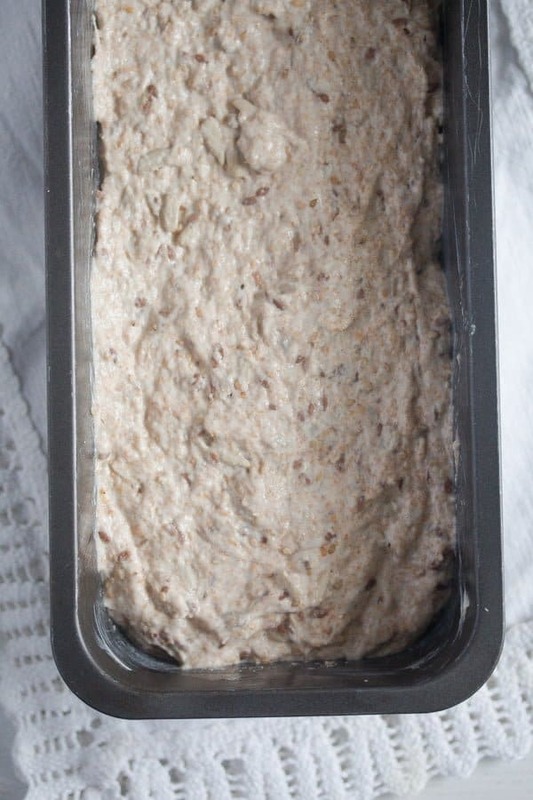 After one hour remove the no-rise, no-knead bread out of the tin. You can check if it is baked properly by tapping it on the underside, it should sound hollow. The bread should also have a deep golden brown color. If the underside is too lightly colored, give the bread (without the tin) 5 or 10 more minutes in the oven. That is not always necessary, I used to do it in my old oven, but I never do it nowadays, apparently my new oven is hotter. It really depends on your oven. 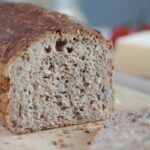 How to keep the homemade whole wheat bread? The wholemeal bread keeps well for several days at room temperature. You don’t have to wrap it or anything. Once you cut a slice, you might want to cover only the cut side with a paper bag or clean kitchen towel to prevent it from getting dry. You should definitely have a slice of this bread while still lukewarm with some salted butter, it is heavenly. Otherwise, once cold, anything goes: jam, homemade spreads, any kind of cheese, cheese spreads, meats, hummus. Dissolve the fresh (or active dry) yeast in the lukewarm water. If using instant yeast, mix it with the flour. Place your bowl on the digital scale and reset the scale. Weigh the rest of the ingredients directly into the bowl. Mix everything with a spoon. The dough will be pretty wet and runny, that is how it is supposed to be. You won't be able to knead it even if you wanted to. Grease a loaf pan (circa 30 cm/ 12 inches long) with butter. Pour the dough inside, level it with the spoon. Place the loaf pan in the COLD oven and set the temperature at 200 degrees Celsius/400 degrees Fahrenheit. Bake for 1 hour. Remove the bread from the pan, check if it's ready by tapping it with your fingers on the underside, it should sound hollow. The underside of the bread should also be a deep golden brown. If the underside is too lightly colored, place the wholemeal bread in the oven for another 5 to 10 minutes, directly on the rack, upside down and without the pan. Take it out of the oven and let it cool on a wire rack. Enjoy warm (with salted butter) or cold with anything else you like. Note 1: You can use instant yeast (to be mixed directly with the flour) or active dry yeast (to be dissolved in lukewarm water). One German sachet of yeast weighs 7 g/ 0.24 oz, which are 4 ½ teaspoons dry yeast. Note 2: Whole spelt flour can be used instead. Saftiges Vollkornbrot from Egghead at Chefkoch.de is the original recipe. There are dozens of versions of this bread and not only by Chefkoch.de. But thank you for letting me know. I don’t like white bread at all. Although, you’d be surprised to see how many types of bread are now available in the supermarket in UK. Soda bread, Polish bread, wholemeal, 50/50, bread made with buttermilk, and, of course, the amazing bagels. I love bagels. I’ve baked bread today, but next time I’m going to try this recipe. I like that its texture is more dense. I love the idea of this bread – especially with all the options. I do love bread making, but sometimes the process can take more time than I have. This one looks perfect. This bread is brilliant! I can’t believe how easy it is to make. It’s so frustrating moving to a place where there isn’t a convenient selection of good bread available. Making your own is sometimes the only option and this recipe makes that so simple! Thanks for sharing!